I’ve loved seeing the mutability of cocktails simply by changing the spirit during these Friday Cocktail Hour posts. This cocktail is in effect a Mint Julep only with rum, therefore called a Mojito. 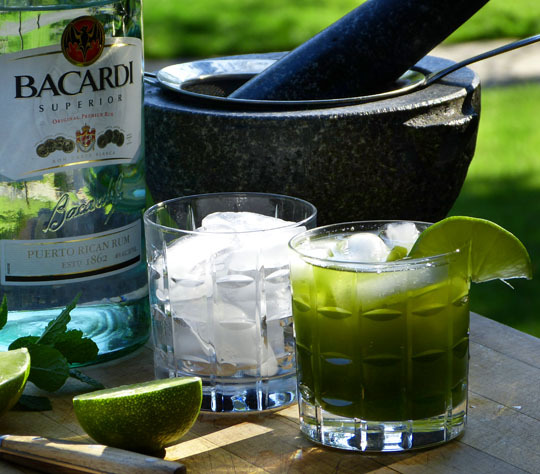 Of course what also distinguishes the mojito from the julep is the lime juice and sugar, the intense sweet and sour. So, does that mean it’s like a whisky sour with mint and rum? Yes, but no egg white. Or like a daiquiri without the mint? All of the above! Regardless, this is a fabulous cocktail to make in the summer when the mint is taking over the garden and the heat calls out for a cooling rum drink. Again, I love the effect of the pulverized mint, the powerful minty flavor it brings to the sweet/sour lime, and the vivid, good-for-you greenness. Old school is simply to muddle the sugar and mint. I’ve never liked the scraps of mint floating dirtily in the clear rum, sticking inelegantly to the teeth. Even more reason to pulverize, grinding up the sugar along with it, and strain. Traditionally, club soda finishes the drink, but, unless you intend to drink five of them, why dilute the goodness? So, herewith, a modified version for the hale and hearty. Combine the mint, sugar, and 1/2 ounce of rum in a mortar and pulverize it with a pestle until the mint is a paste and the sugar is dissolved. Add the remaining rum to the mortar and let it rest while you ready a lowball glass with ice. Pour the lime over the ice. Strain the rum-mint-sugar over the ice. Press the mint in the strainer to squeeze out as much liquid as possible. Garnish with lime, if using. Serves 1 (1 is just right, 2 is too many, 3, as I learned in New York with the mint julep, is never enough). Hemingway loved a great mojito, learn what other writers enjoyed drinking. Simon Ford shares where to drink cocktails when you are in Havana, Cuba. Try making a refreshing cucumber lime mint agua fresca. © 2012 Michael Ruhlman. Photo © 2012 Donna Turner Ruhlman. All rights reserved. Demon Rum has bad memories for me, so I prefer the Southside which uses gin for rum and simple syrup for sugar, along with the lime and mint. A summer delight that is a lot less trendy than the mojito. Oh lord yes. 🙁 Joy sucking losers you would love to see tased. So you don’t just muddle the mint and sugar but make a paste? Interesting. I’ve only ever had it with big pieces of mint, where the issue is accidentally drinking a whole mint leaf and/or getting it stuck in your teeth. I think I need to try it this way. That is the most amazing shade of green I have ever seen… Great photo! “Trendy” is probably the last word I’d use to describe the mojito. But then again, my image of it comes from my husband’s childhood memory: old Cuban gents smoking cigars, drinking mojitos out of plastic cups and cheering raucously for their favorite players at the jai alai fronton in 1960s Miami. I love that for some reason. I thought Bacardi was the only kind of rum until a Venezuelan bartender introduced me to Pompero Aniversia and Pyrat. Now I have a large assortment of sipping rums, my favorites are the the above and Methuselah, Babencourt, Ron Zacapa, Fleur De Canya, Zaya – the Gautemalen Zaya – not the Trinidad, Diplomatico and the Cuban Havana Club 7 that you can get in Canada, it’s illegal to bring in the U.S., it looks a lot like Tazo iced tea – not that I’d ever think of putting it in an ice tea container, I watch Locked Up Abroad and know what happens to smugglers. These may be to good to use in a mojito, I’ve used a 7year Fleur De Canya in a mojito and a Mai tai. The only thing I could bring myself to mix the nicer ones in would be the aged egg nogg, which will be 3 years old this Dec, one precious bottle left, and the first glass will be raised to Rip & Michael Ruhlman come December. Cheers, happy Friday to all! glad you brought up types of rum, thanks! Oh, Pyrat rum from Anguilla…seriously good sippin’ stuff. Not sure what the current thinking is, however, on dark rum in a mojito. No reason not to try it, though. I like the staging of the photo; it makes the drink look so appetizing. I want to go into the kitchen and make a frosty cold beverage NOW. Studying first. Happy Friday! Mr. Ruhlman, you need better ice. It does make a difference. I used your Mint Julep post and did this a couple weeks ago. But then I froze one cup of watermelon juice in a zip lock baggie. Wrap it in a hand towel and use a multi-purpose cast iron skillet to beat it into snow. Use the watermelon ice instead of water cubes. Not traditional, but amazing. A nice twist on this is “The Old Cuban”, where you top the cocktail with champagne instead of soda. Excellent. I like a mojito made with tequila occasionally. Not sure if there’s a name for it. Kind of like a cross between a margarita and a mojito. Sometimes I also substitute basil for something different. Bacardi is not rum. It is an advertising conglomerate. And while you’re sipping on that cocktail, feel free to look up labor practices among sugar cane plantations in the Caribbean. You might be surprised. yes, please shelve the tasteless Bacardi and go for the Flor de Caña 5 or 7 year old (yes, spelling is correct). Zacapa 15/23/XO are wonderful as well, but to good to use in mixed drinks.